VPR investigated which Vermont towns issued the most traffic tickets last year and how much revenue they received as a result. The top two towns, Plymouth and Bridgewater, have a couple of things in common. They both contract the Windsor County Sheriff's Department for speed enforcement services, and that department issues nearly three times as many tickets as any other law enforcement agency in the state. In these towns, revenue from heavy speed enforcement completely offsets the cost of law enforcement for taxpayers. And it leads to thousands of dollars in profit for Windsor County Sheriff Michael Chamberlain. Chamberlain is entitled to takes home 5 percent of the contract, per state law. Last year, that was roughly $10,000 for each of the two towns. In at least one of the towns — Plymouth — Chamberlain's contract increased by 205 percent over five years. And although Plymouth and Bridgewater are both on busy roads that ferry skiers to popular ski destinations, they only get about half as much traffic as highly traveled corridors like Route 100 near Stowe or Route 7 between Rutland and Burlington. EXPLORE THE DATA: How much did your town earn from traffic tickets in 2017? The state last conducted a speed study in Plymouth in 1973. Most tickets in Plymouth are issued in a 35-mile-per-hour zone on Route 100. Plymouth, Vermont issued more than $415,620 in traffic ticket fines in 2017 — more than any other town in Vermont. Most tickets were issued in a 35-mile-per-hour zone on Route 100. The state last reviewed the speed limit there in 1973. Since then, a handful of institutions have closed. “There’s no ski mountain, no school, no store anymore, and nobody walks on the road,” said Plymouth resident Erica Bizaoui. According to Amy Gamble, a longtime traffic operations engineer with the Vermont Agency of Transportation, the state’s traffic committee rarely raises speed limits. Many in Plymouth appreciate the low speed limit. “Vermont Route 100 has been neglected,” said Ralph Michael, chair of Plymouth’s select board. He sees fast moving vehicles swerve to avoid potholes, and fears especially for bicyclists. The enforcement, Michael said, is designed to protect their lives. "We actually have bicycle tours that go through there," Michael said. "You can’t even stay on the edge of the road with a car!" Even though the Bridgewater Village School closed three years ago, the 25 mph "school zone" speed limit stayed in place. Although Plymouth receives more revenue from traffic tickets, deputies issued more tickets in Bridgewater than anywhere else in the state in 2017. The vast majority of those tickets were issued in a 25-mph zone one third of a mile long. This was initially a “school zone,” meaning the 25-mph limit was only enforceable when kids were present or lights were flashing. But in 1983, Agency of Transportation records show, the statewide traffic committee decided to convert all existing school zones in villages and cities into full-time speed limits. That included Route 4 in Bridgewater. Consequently, even though the Bridgewater Village School closed three years ago, the “school zone” speed limit stayed put. An excerpt from a March 16, 1983 letter from Lt. Alfred C. Morrison to Bridgewater town clerk Margaret Phelps regarding school zones. Since 1983, more than 20 schools have closed across the state. 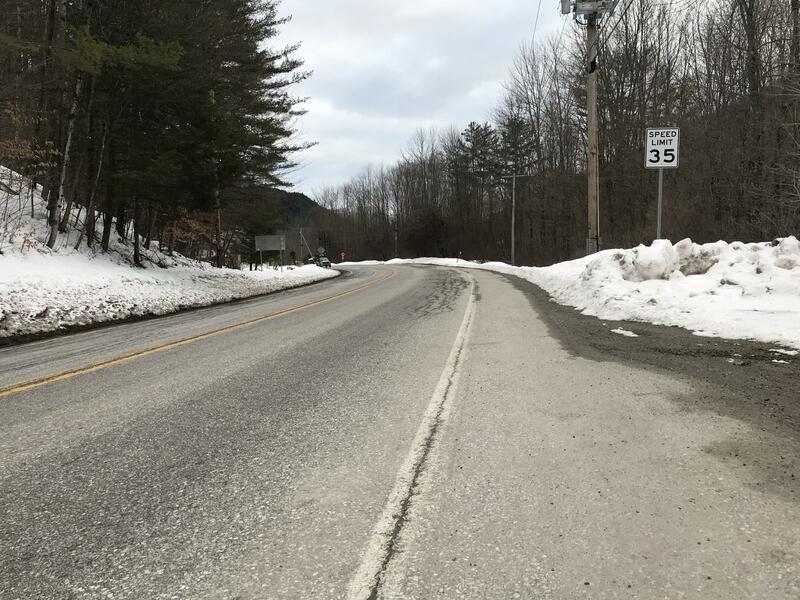 Amy Gamble, traffic operations engineer for the Vermont Agency of Transportation, said when schools close, the state does not reassess the speed limit in the now permanent "school zones." 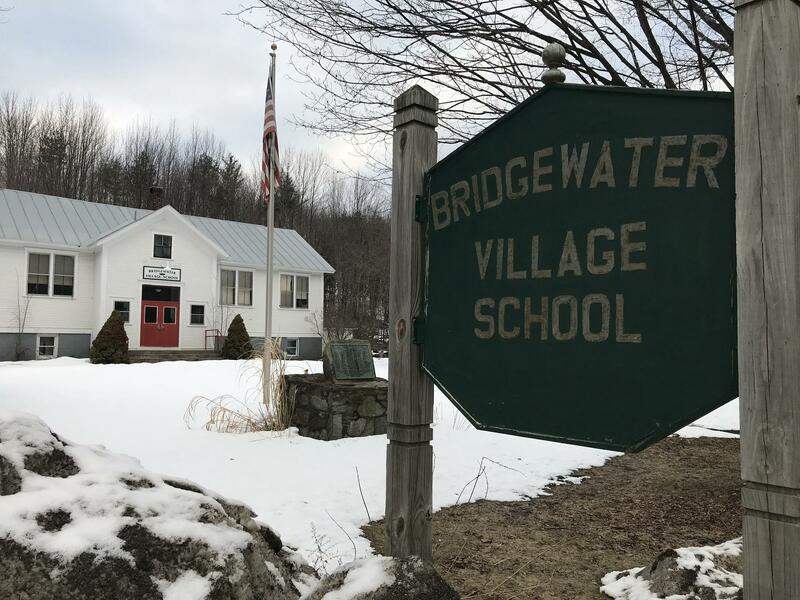 The town of Bridgewater hires Chamberlain’s department to enforce the speed limit on Route 4 for 12 hours a day, seven days a week. Town Constable Collen Doyle would like the to find other ways to slow speeding drivers in Bridgewater. Doyle is 29 years old and moved back to Bridgewater from New York City a few years ago. “I often joke around and say ‘I’m on the mean streets of Bridgewater,’” he said. 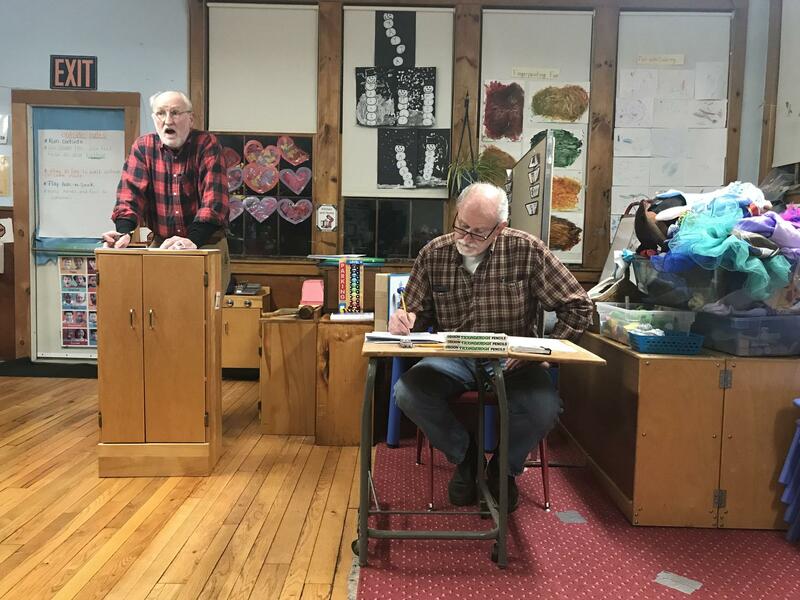 Town moderator Robert Gasperetti, at podium, and town clerk Bill Basso, seated, preside at Mount Tabor's 2018 town meeting. In Mount Tabor, the 45 mph speed limit has enabled a single police sergeant to issue more than $230,992 in fines in 2017, reducing taxpayers' burden by more than 25 percent. At 10 cents for every $100, Mount Tabor’s municipal tax rate is among the lowest in the state. Although the rate has always been low, today it is nearly one third what it was in 1999. That’s the year the state’s transportation committee lowered the speed limit on Route 7 in Mount Tabor — against the recommendation of engineers at the Agency of Transportation. READ — You Paid Your Speeding Ticket. Here's Where Your Money Went. In March 1999, Wendell Davidson Jr., chairman of the Selectboard for the town of Mount Tabor, requested either a stop light be installed, or the speed limit on Route 7 in Mount Tabor be reduced from 50 mph to 45 mph. “It is very difficult for disabled or blind people to get across this road,” he wrote to the Agency of Transportation. An Agency of Transportation engineering study supported a speed limit of either 55 or 60 mph. Short of other factors, such as limited sight distance or high crash incidents, federal guidance and best practices recommend the speed limit be set at the current rate under which 85 percent of motorists drive. In Mount Tabor, the 85th percentile was 57 mph. Instead, agency engineers recommended the speed limit remain at 50 mph. In the absence of other factors such as limited sight distance or high crash incidents, federal guidance and best practice recommend the speed limit be set at the current rate under which 85 percent of motorists drive. They presented their recommendation at a public meeting held by the Vermont Traffic Committee. The Committee consists of three members: the state’s secretary of the Agency of Transportation, commissioner of Department of Motor Vehicles and the commissioner of the Department of Public Safety. According to the minutes, no resident of Mount Tabor was present at that June 1999 meeting. The town’s law enforcement officer was present: Wallingford resident Nelson Tift. He mentioned that two residents with disabilities cross the street and that a reduced speed limit “would be easier to enforce and lower the speeding in this area.” The committee then voted to reduce the speed limit to 45 mph: at least 10 mph below what federal guidelines would have supported. Sergeant Tift issued more than $230,992 in fines in 2017, reducing taxpayers’ burden by more than 25 percent. Excerpt from documentation of the June 1999 Traffic Committee meeting that addresses the Route 7 speed limit in Mount Tabor. Amy Gamble, traffic operations engineer with the Agency of Transportation, doesn't find the events in Mount Tabor surprising. Play around with the table below to learn about last year's traffic ticketing in other Vermont towns. You can type a specific town or city in the search field, as well as sort the different column data. Viewing on mobile? Tap HERE. *Please note: the field labeled "Payments to Municipalities" is comprehensive, while the field labeled "Number of Tickets" omits a small subset of traffic violations issued under 23 VSA 1081. This can explain blank entries in the "number of tickets" field. See our methodology post for more information. (Updated 4/26/18). Thanks to Noah Villamarin-Cutter for his assistance scraping and presenting the data. This report comes from VPR's investigative reporting desk. VPR is committed to investigative journalism as part of its mission of public service. Have a tip for the investigative reporting desk? Send an email to VPR reporter/editor Emily Corwin. You Paid Your Speeding Ticket. Here's Where Your Money Went. The laws that determine how speeding tickets are issued and processed in Vermont are labyrinthine.